Filed under writing on July 04, 2017. Today I announce, I am writing a book! Yes, I’ve written books in the past, but this is my first piece of fiction. I’ve been working on the plot, scenes, characters, themes and research since February 20th, 2017; a day I noted in my writing journal. 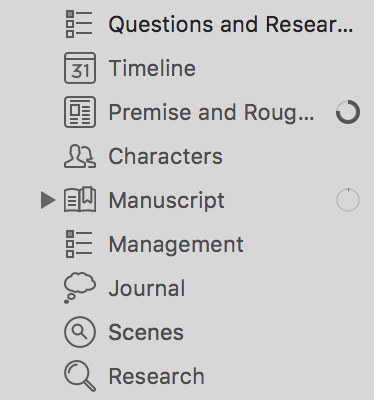 I use Ulysses for macOS to write, manage, and journal about, my book. I am preparing for NaNoWriMo in November and the story is a geeky piece of genre prose. Announcement DONE; now the tip. While fleshing out details of my plot, I developed a timeline of events in Ulysses. The purpose of my timeline is to understand the relationship between specific dates and how events affect my characters and story. Ulysses made the timeline creation process simple and fun. The Timeline group contains timeline sheets, one sheet for each daily event in my story. Each sheet title follows a specific syntax. My first sheet in the group contains an annual calendar for a specific year (No, I am not divulging the year of my book). Here’s how I create that sheet. My Calendar sheet includes every month of the year stacked vertically. The Calendar sheet serves as a quick reference to the narrative year. 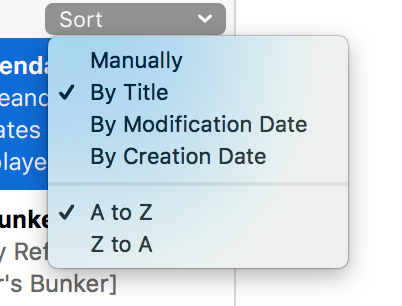 I then select the sort method to Sort by Title and A to Z as shown in the image below. Quickly add new timeline sheets using ⌘ + n, followed by the title. Ulysses will automatically place timeline sheets in chronological order as they are created. Watching sheets fly into location is part of the fun. To see the timeline in reverse order, choose Z to A as the sort method. A quick ⌘ + o let’s you search quickly for an event in a timeline, or if known, a specific time. If you need hour and minute granularity on your timeline, add -HH-MM to the title syntax after the date. Now you can plot out your narrative to the minute! I use a text expansion macro in Keyboard Maestro to ensure I use the correct title syntax. 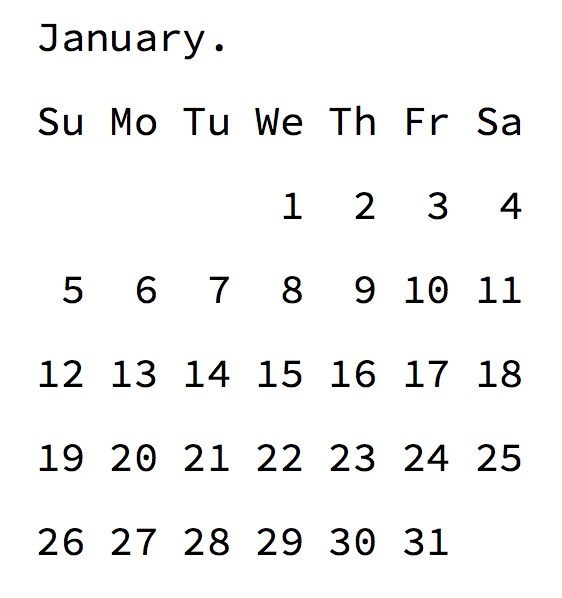 Remember the calendar I created earlier. You likely know why I use 0000-00-00 for the date. This date ensures the calendar sheet will always be the first in the timeline. If you have another reference sheet you need at the top of the group, simply title it 0000-00-01. I will not have all events from my book in this timeline before I begin writing in November. What I love about this technique is that as I discover new events in my narrative, I can quickly add them to the timeline and view their relationship to the story. As I write my first draft, this timeline will serve as an excellent guide along with my outline. It will likely become invaluable during the revision process as I tighten my story. I hope other authors using Ulysses find this technique useful. If so, let me know in the comments below. I’d also be interested in your thoughts on how we can make this timeline even more useful. Are you a literary agent or publisher looking for a motivated, experienced writer with an intriguing genre story? Why not get in touch with me now and learn more. First draft will be finished by December 2017 with an anticipated final draft ready by in the second quarter of 2018.